Norey Agudelo's artwork has brought a significant new trend of painting to the United States from South America. In a 1980 exhibition at the Government Hall of Valle in Cali, Colombia, Ms. Agudelo introduced a new concept called "El Primimodernismo," as a personal idea based both on her observation of the visionary motifs in Pre-Colombian Indian art, and the styles of Universal Modernism. Incorporating these principles into a theory she describes as "Human Activation Through History," she presents a sympathetic view of the human effects of major international events, such as the 9/11 tragedy. Noriam's art elevates the spiritual sense of destiny and human drama. In the development of her personal style from the roots of Pre-Colombian and Modernism, Noriam has explored aspects of these roots by painting softly animated figures, reminiscent of the Latin American Social Realists of the 1930’s, against the backdrop of semi-abstracted landscapes and architectural cityscapes. In the case of her series begun on September 11th and 12th , 2001 -- "Flight of the Lambs", "World Wide Panorama," and "Wake Up from the Spiritual Life" -- a frenzy of color tells the intensity of the story. Faces show expressions of anguish, hope, or remembrance, set against the scene of collapsed chrome and steel upright shards, the broken buildings of the World Trade Center. In each painting, the blending of bright colors convey the immensity of this unprecedented tragedy in its human scale and meaning. The surface base of her paintings are the soft texture of two-dimensional patterns, which emphasizes the foreground of primitive forms. As a foreign artist working in the US, Noriam’s own soft personae understates her unique and significant contribution to art. 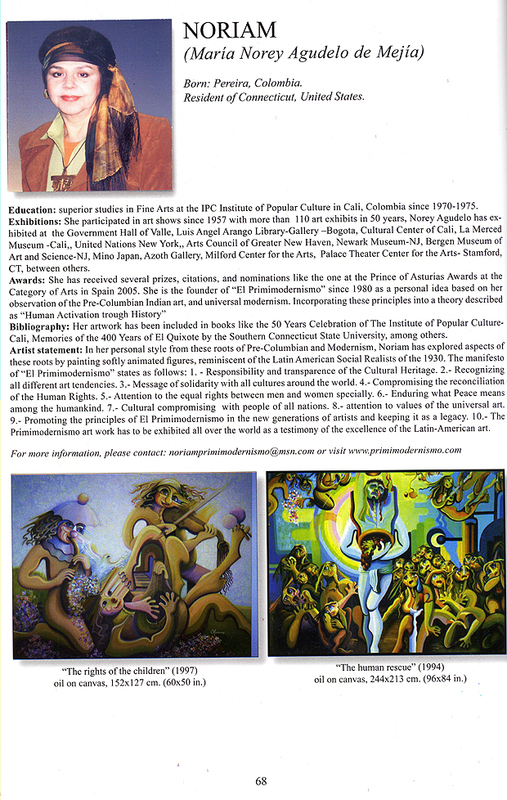 From the time of that introduction of her theory of primitive and modernism, her reputation gained incrementally over the decade of the 1980s: As the founder of this trend of painting she was given the appellation, "El PrimiModerismo" by the Colombian art community and press, and was subsequently invited to participate in many important exhibitions. 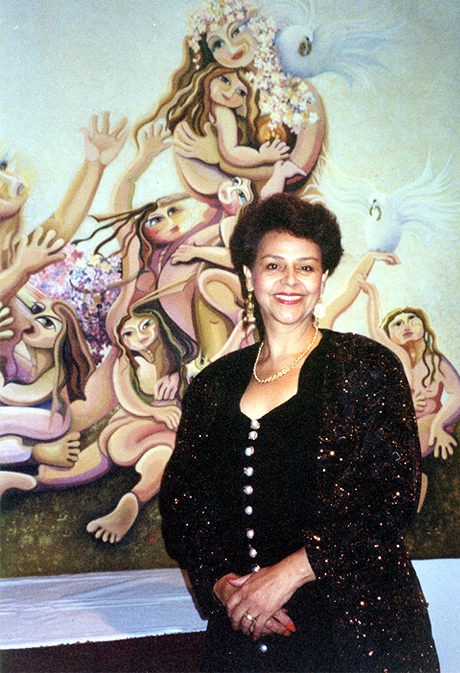 In 1994 she was invited by the United Nations Headquarters in New York City to exhibit her mural size oil painting "CHANGE THROUGH PEACE," for the celebration called "Hands Shake Around the World," attended by fifty ambassadors from many countries. Noriam working in her studio. Looking at Noriam's paintings over the years shows a development through several stages of her personal artistic style. In earlier work, color usage goes from gradations of muted colors within various tonal ranges but evolves in later work into expressions of harmoniously contrasted bright rhythmic values. The composition of the canvas field evolves from topological layouts of similar figures into a deeply inspiring and poignant telling of the story between two or three figures -- including symbolized forms such as the white dove symbolizing "peace". In "Human Rescue," a mural painting, Norey Agudelo uses stylized figures combined with flat color to emphasize man as a suffering yet universal being. In a later work," Flight of the Lambs," her figures are charged with highly expressive color and form, and through a triangulation in the placement of the two figures and a dove, tell the story at a glance. Focus is placed at the center of human emotion. Facial expressions are refined into three-dimensional personalities with sensitive and subtly-expressed individualities, each providing an evocative depth of human understanding-- primary colors, like red and yellow, for primal feeling. From the complexity of backgrounds of flat colors depicting surreal locations there emerges the later interpretations of textured multi-layered dimensions: spatial realms which appear real but seem beyond time. "Noriam" has been invited several times for a lecture about her artwork at Southern Connecticut State University and nominated for the Prince of Asturias Awards in the category of Arts 2005, which is one of the biggest honors she has achieved for her whole career. Past year the School of Medice at Yale University invited her to be one of the instructors for a local program "Art Therapy" focused in children for the community of New Haven, that is why she recently painted the mural size painting " The Victory of the Children". Other exhibits have been performed lately at Stamford for the Arts in CT, Open Studios of Greater New Haven, Art Space and future exhibits are being planned for next year 2007. Currently "Noriams" is writing her book titled: " El Primimodernismo, the new tendency of the Contemporary Art". Ms. Norey Agudelo’s work as a teacher and an artist represents a deep and significant contribution to a Humanistic interpretation of life in our time, and the evolution of pictorial art itself. Born in Pereira, she obtained a degree in 1975 in Visual Arts from the Popular Institute of Culture in Cali, Before coming to live in the US in 2001, she was Department Director of the Arts School, and art teacher at Alfredo Vasquez Cobo College and at Colombo Britanico High School in Cali. In addition to the 1994 exhibition of her work at the UN, her artworks have been exhibited around the world -- in Colombia, in Mino, Japan, in New Haven, CT, and in New Jersey museums in Bergen, Passaic, and Patterson. 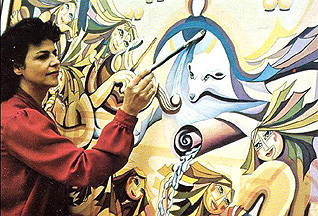 She has donated large murals to social causes for the International Immigrants Foundation of the UN and the Consulate of Colombia in New York City. She has written her research on the civic expressions of art, and the appropriation of public spaces, and has received many well-deserved certificates of honor and achievement.